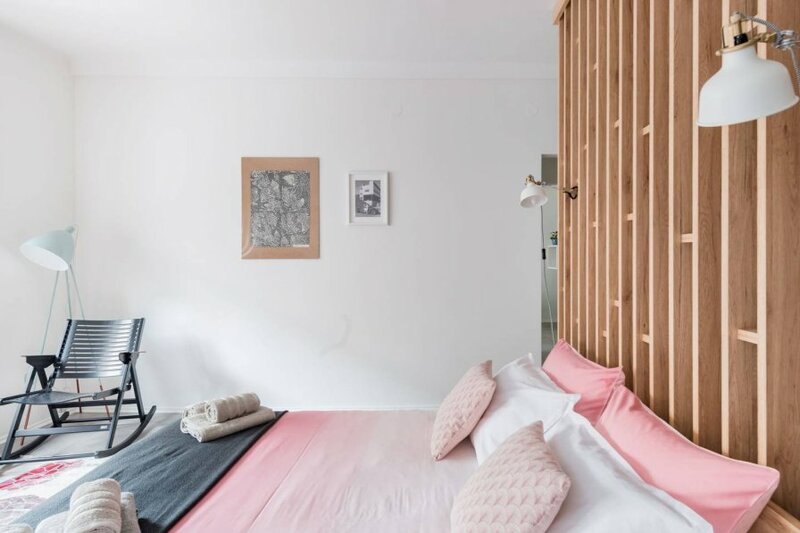 This 1 bedroom apartment is located in Ljubljana Center and sleeps 2 people. It has WiFi and parking nearby. Experience authentic Ljubljana at this meticulously-designed flat in an historic Art Deco building. The plant-filled property features furniture from Slovene designers and colourful accents, while the small balcony is perfect for people watching. You've never slept in a bed like this. A custom-made one-off, it functions both as a bed and as a divider, separating the space visually but letting it breathe. Designed by our friend who splits his time between designing yachts and making just about everything imaginable out of wood, it's both an integral part of the room and a great place to sleep. And combine this with memory foam mattress, you will sleep like a baby. Since we all strongly believe in sustainability, the materials were sourced locally, and the workshop where it was crafted is less than half an hour away. The kitchen is very well equipped, with an energy-efficient dishwasher and refrigerator, and a stove, as well as a gorgeous espresso machine and all the pots and pans you need to make a great meal from the fresh produce you bought at the farmer's market (which is like 5 minutes away) or just check our guidebook for the best pizza delivery in town. There are also some basic breakfast items, like healthy oatmeal mix, many varieties of tea to artisanal coffee roasted in Slovenia with the associated mokka pot. Same amazing designer + craftsmen team also made the kitchen, using the same materials, as well as those gorgeous shelves you see in the pictures. Did I mention the bathroom is heart-achingly beautiful? We preserved the original vaulted ceiling, and used the most gorgeous 3D Italian tiles to produce a bright, inviting space that ends in a spacious walk-in shower. Equipped with hair and body care produtcs. Just look at the pictures and tell me you don't want to take a shower here. Go on, I'll wait. Oh, but there is just a bit more. There's a cozy balcony, just big enough for two people to enjoy a coffee or a drink, with osb wooden flooring, two chairs and a table. Just what you need to relax, talk and laugh. Rainy day? There's a rocking chair and loads of books, as well as a TV with loads of channels and NETFLIX- to watch your favourite shows and movies. You name it, we'll make sure to send you to the right place. The flat is yours for the duration of your stay. We promise never to come by unannounced. Anything you want to know, ask us. We're a little light on historic facts, but we make up for it by knowing everything about what's happening now. Concerts, art shows, exhibitions -- tell us what you like and we'll tell you where to find it. Bus schedules, train timetables? We'll decipher those bastards to the best of our ability for you. Need a suggestion for a day-trip? We do one almost every weekend, and almost never to the same place. In other words: we'll do our best to be your living search engine for both Ljubljana and Slovenia for as long as you stay. We value privacy very highly. You'll find the property in an historic neighborhood just outside the Old Town. Although the city's best nightlife is just a short walk away, the flat is located on a quiet street, with a view to the Alps on one side and Castle Hill on the other. With its central location, almost everything Ljubljana has to offer is within easy walking distance. • 12 min walk from the main rail station. If you arrive by car, there's a secure car park at the end of the street, with parking from about EUR 10 per day. Alternatively, you can leave it at one of the free Park&Ride car parks at city outskirts, and we'll give you a lift to the flat.